I only had one blip last week, on Thursday evening after a long day at work at the end of a long half-term I sent Mr. TBaM to the chippy, my heart was not in making something from scratch! 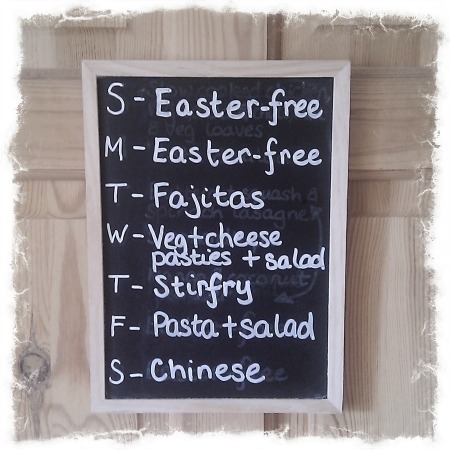 This week's meal planner is obviously reduced due to the Easter weekend. Sunday: free for Easter festivities. Monday: travelling back from west Wales so I'll be needing something easy. Tuesday: fajitas, an easy way to get the veggies in to our diet. It can be a healthy option if I don't cover everything in dips and cheese! Wednesday: vegetable and cheese pasties, and salad. When I was off on maternity leave, I made pasties all the time, they were such a frugal and relatively healthy (low-fat butter and thin pastry) option for dinner. I'm trying to pinch the pennies for various reasons and need to make a big batch of these. Thursday: vegetable stirfry. Can you try I'm trying to get more veggies into our diet? Saturday: Chinese. I made a batch of deep-fried tofu the other week and it lasted for a few meals. I'll be making some more. I've just learnt some nonsense that crispy seaweed is not seaweed? I refuse to believe it, I felt I was getting in touch with my Welsh side and appreciating laverbread. I need to use the next fortnight off work to batch cook some meals for the freezer, money-saving and far healthier. Crispy seaweed isn't seaweed? Is it just some glorified iceberg lettuce type thing? Noooo!! I make pasties in batch and then freeze them. It's really quick to then just shove in the oven! Apparently it's Kale. I could cry! Batch cooking is definitely the way forward. All my meals (except for the beans on toast LOL!) come from the freezer so all I need is breakfast and lunch stuff from Sainsburys. I have been contemplating pasties…. I think i would need to use ready made pastry though – too lazy! No, not ready-made pastry! I like making the pastry and putting dried onions and herbs into it. I love doing a big batch of homemade pasties as well- great to pop in the freezer for busy days. Lindsay Bareham's 'Pasties' book has some brilliant ideas for fillings, if you don't already have it. I think it makes me feel like a 1950s housewife! I just need the floral pinny and I'm done. I'm vegetarian, so feel a little limited to veggies and cheese. If you do have any other ideas, I'd love to try them! "Those meals sound gorgeous, even though I am veggie. Love the sound of Friday's curry." Oh, I have the perfect pasty recipe for you. I made them about a month ago and they were fab. They look good thanks for the tip!